Britain’s longest, and perhaps most famous road the A1, which is known in part as the ‘Great North Road’, stands at 410 miles (660km) in length, and connects the two capitals of England (London) and Scotland (Edinburgh) in one direct route. Original parts of it were built by the Romans, always easily distinguished by its direct routing. Over the years, the numerous upgrades and widening programmes have revealed both Roman settlements and Roman artefacts now totalling their thousands. Much has been written about the A1, both its history and its legacy, but little about its aviation connections. It is therefore along this route that we next travel, for here we find many of Britain’s wartime airfields, and while most have now disappeared into the history books, a few still linger on operating the fast jets of the current Royal Air Force. With such a huge route to cover, it will take time to travel from one end to the other, but it is along this route that we begin our next trail, Trail 54, The Great North Road. The majority of these airfields, of which there are literally dozens, lie in Northern England, but include notable examples such as: Old Warden (The Shuttleworth Collection), Brampton, Alconbury, Glatton, Wittering, North Witham, Bottesford, Winthorpe, Dishforth, Leeming, Brunton, East Fortune and Macmerry as its close or direct neighbours. Our first stop in this next trail, is one of the lesser known airfields along this route, one that sits on the very edge of this great road, and one that survives today, not as a military site, but as a civilian airfield where flying is a strong today as it was during those dark days of the 1940s. 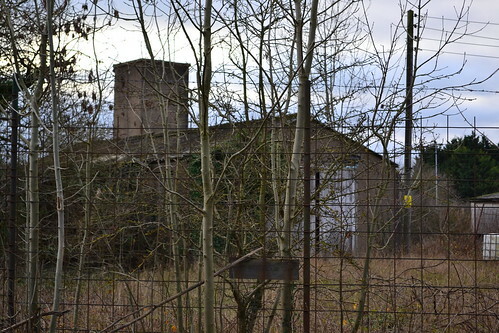 From Newark in Nottinghamshire we travel north where we find our first stop, the former RAF Gamston. Gamston is a little known airfield, but it is one that played an important part during the Second World War. Opened in December 1942 it was a classic Class A airfield, built with three concrete and tarmac runways with a main runway of 2,000 yards and two subsidiary runways of the standard 1,400 yards forming the distinctive offset A frame. A perimeter track linked all three runways with thirty heavy bomber hardstands located around its length giving an indication as to its wartime role. Further clues to this role are the four type T2 and single B1 aircraft hangars, designed large enough to hold medium to heavy bombers of the RAF. As with all wartime airfields, the technical area came with a variety of ancillary buildings, workshops, MT sheds (12775/41) and stores. Gamston’s former Watch Office is now a residential property. 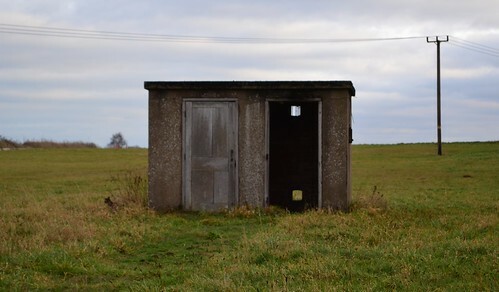 With temporary accommodation for almost 1,000 male ranks and over 300 female ranks, it was by no means a large airfield, but at a cost of £468,000, it was quite an expensive airfield to build. When Gamston was being constructed in 1942, Bomber Command was going through a period of reorganisation and re-equipment. At the beginning of the year there were six operational groups: 1,2,3,4,5 and 8 along with two training groups 6 and 7. No. 8 Group was disbanded only to be reborn as the Pathfinders in January 1943 whilst No. 2 Group was transferred to the Tactical Air Force in that same year. A further part of this reorganisation was the renaming of 6 and 7 Operational Training Unit (O.T.U) Groups as No. 91 and 92 (OTU) Groups in the May 1942. In the June, another new Training Group No. 93 (OTU) Group was formed, giving three training Groups in total under Bomber Command’s control. 93 Group bucked the general trend at this point in the war, being the only expansion in what was basically a shrinking Command. It was this third Group, led by Air Vice Marshal P. E. Maitland, that Gamston would fall beneath, joining in a collection of twelve airfields: Finningly, Bircotes, Worksop, Ossington, Castle Donnington, Wymeswold, Lichfield, Church Broughton, Hixon, Seighford and Peplow that all fell under the direct control of the headquarters at Eggington near Nottingham. This meant that the responsibility of No. 93 Group stretched from Shropshire in the west, through the centre of England into Derbyshire and Nottingham, and north as far as Yorkshire. The purpose of these Operational Training Units was to meet the demand for new crews whilst conducting operational flights with experienced crews as their leads. To this end, Gamston’s closet neighbour Ossington, was to be its ‘parent’, Gamston forming the satellite airfield for all flying operations. 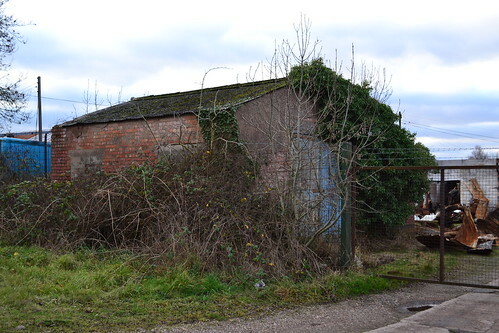 One of the many buildings left standing on the Technical Site. The first unit to use Gamston was No. 82 Operational Training Unit, who were formed at Ossington on June 1st 1943 with Wellington MK.IIIs. Over the time that 82 OTU used the two airfields, they would also fly Wellington MK.Xs. Martinets, Oxfords, Tomahawks, Miles Masters and the Hawker Hurricane. Their period of operations lasted for almost two years until they were disbanded in January 1945 just prior to the war’s end. 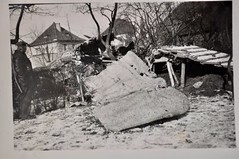 Flying mainly out of Ossington, 82 OTU wold have their fair share of fatalities, with their first occurring with devastating effect on August 9th 1943, with the loss of all five crewmen and the first total aircraft write-off since forming. The first Gamston based fatalities occurred on 12th October that year, when Wellington MK.X HK201 took off on a training flight. Immediately after take off the port engine cut out forcing the aircraft down. Three of the seven crew were killed, the remaining four being treated for their injuries in hospital. For his actions that day, F/O. J Coughian was awarded the DFM. Gamston would also serve as a safe haven for other operational bombers returning from action over occupied Europe. On December 1st 1943, a No. 9 Squadron RAF, Lancaster MK.I was returning from operations over Berlin. In attempting to land at Gamston, the aircraft DV334 ‘WS-C’ crashed killing six of the eight crewmen on board. The remaining two crew, Sgt. C. Rickards and F/S. 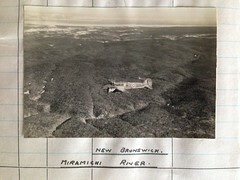 L. Owen (RCAF), both being injured. This tragedy brought an end to 1943 but not a change in luck for the training crews of 82 OTU. Many buildings are overgrown and in a poor state. 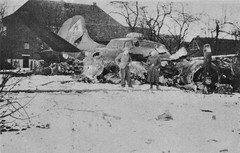 The January and February 1944 brought two more accidents, the first without fatalities as F/L. D. Parry brought the aircraft, a Wellington MK.X, down with its wheels retracted after the port engine lost power. F/L. 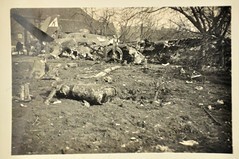 Parry was uninjured in the accident unlike his five colleagues, who on the night of February 3 – 4, were all killed when their Wellington ‘X3409’ was seen to dive into the ground near the airfield resulting in a massive explosion. The crew, four Canadians and an Englishman, all perished. Being an operational training unit, 82 OTU would participate in operational duties, such as flying ‘Nickel‘ operations (leaflet dropping) over occupied Europe. 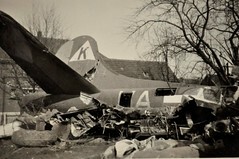 One such operation saw the loss of Wellington MK.X on the night of May 14 – 15 with the loss of all as the aircraft ran out of fuel on the return flight from Rennes. Another near tragic accident occurred in June when a returning bomber, a Halifax from 1667 HCU was trying to make an emergency landing at Gamston when it collided with a stationary Wellington. 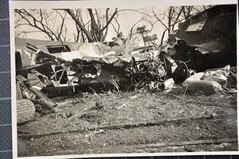 There were no injuries in the collision but it was another event that brought home the dangers of flying heavy bombers in wartime Britain. With two further losses in August 1944, and another in April 1945, death or injury were never far from the minds of the crews. Even as a ground crew you were not safe from the slightest lack of concentration or slip. In November, an accidental spark caused by a slipping airman ignited petrol in one of the hangars whilst working on Wellington MK.X ‘HK750. The accident on November 13th 1944, proved fatal for the Wellington destroying it completely in the subsequent fire. 1944 saw yet further changes to the Training Command. In June, the number of Bomber Command Squadrons increased, conversion training was taken away from the main squadrons and given to a new Heavy Conversion Group No. 7 (HCU) Group. it was also decided that a new OTU was required and so ‘C’ Flight of 82 OTU was moved permanently to Gamston where it was re-designated No. 86 OTU who would specialise in the role of night training with both the Wellington MK.III and X. This was a short-lived unit though, lasting only until October 15th that same year before being disbanded. Crews from 86 OTU were then used to form the Heavy Glider Conversion Units elsewhere. A gradual reduction in crew losses toward the end of 1944 meant that 93 (OTU) Group could now be disbanded, with the operational training being consolidated into the two original groups. By the end of February 1945, No. 93 (OTU) Group was no more. As the war drew to a close, other training units also began to close. No. 30 OTU who were originally formed at Hixon in June 1942, also with Wellingtons, moved to Gamston where they were disbanded on 12th June 1945. Their final days at Gamston would not be the quite and sedate ending that many would have hoped for though. On May 18th, a month before disbanding, Gamston would see its final wartime loss, when Wellington NA718 ‘BT-O’ crashed killing both crewmen: F/O. Robert Fraser Thompson (s/n:174908) and Leading Aircraftman. Douglas Fletcher Dryden (s/n:1353162). It is not known what caused the accident but, the pilot had attempted to glide the aircraft back into Gamston without success. With the closure of these units, Bomber Command began the rapid decline that would see it become a shadow of its former self. Crew training was put on hold, aircrew held pending a decision as to where to send them and aircraft mothballed. Once the European war was finally over, Gamston’s flying days were over, at least for the time being, and from July 1945, it became the main resettlement camp for repatriating Royal Australian Air Force personnel. The responsibility for this fell to No. 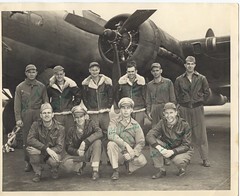 9 Aircrew Holding Unit (ACHU), where crews were sent before departure to either the Pacific Theatre or more likely home. Once all the residents had departed the Nottingham site, it lay dormant, being used primarily for agricultural purposes. Many buildings a re left open to the elements. For 8 years the airfield remained closed, but over 1950-51, the site was used for motor racing activities. Small races were held but these never truly ‘took off’ and any future use of the site for such activities, were curtailed in May 1953, when Gamston reopened as a satellite for nearby RAF Worksop, where No. 211 Advanced Flying School (AFS) were currently based. The aircraft type had now changed and the jet age had dawned. The RAF’s latest jet aircraft the Gloster Meteor and de Havilland Vampire now being the aircraft to utilise Gamston’s runways. No.211 AFS would go through several numerical changes over the next few years, on June 1st 1954 it became 211 Flying Training School (FTS), disbanding on June 9th 1956 to be absorbed into No. 4 Flying Training School (FTS). This in turn was disbanded at Worksop in 1958 to be reformed at RAF Valley in Wales – thus ending the links with Gamston. All through these changes, the aircraft remained primarily the same types, Meteors, Vampires and Prenctices of various marks. It was during this time, on 1st April 1955, that a Gloster Meteor T.7 WL474 of 211 FTS would crash 2½m north-east of Gamston whilst performing asymmetric training. During the manoeuvres the aircraft dived into the ground killing both its crewmen: F/O. Stanley T. Jenkins and Acting Pilot Officer Duncan H. Moffat. Gamston then again closed in 1957, but although officially closed it was used during the 1970s and 80s as a satellite landing ground by training aircraft from RAF Finningley. These consisted mainly of the small de Havilland ‘Chipmunks’ and later Scottish Aviation’s ‘Bulldogs’. Then in 1993 when the site was purchased by Gamston Aviation Limited who opened and operated it as a civil airport under the name Retford Gamston Airport. Gamston’s former runway is still in use (in part) today as part of Retford Airport. Since then, Gamston has been upgraded with maintenance work being carried out on both the hangars, usable runway and perimeter tracks. Whilst these are part of the original infrastructure, they are much smaller only dealing with single or twin-engined light aircraft rather than the larger bombers of Bomber command. The airfield is a going concern today, the main site operated by the Airport Authority whilst the technical area is a small industrial unit. 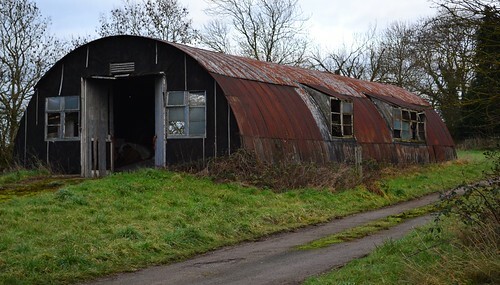 Within this, there are numerous original wartime buildings still surviving in varying degrees of condition. 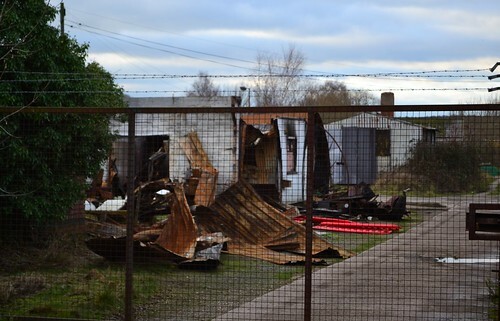 The various stores are used for storing of industrial ‘components’ and general industrial rubbish, whilst another houses a car repair shop. Discarded vehicles lay buried beneath an ever-increasing range of thorny shrubbery while the whole area is fenced off and basically left with little outside interest. Accessing the two sites is best from the A1, the industrial area is the first turning off this road and takes you along the former perimeter track past the end of the former main runway. 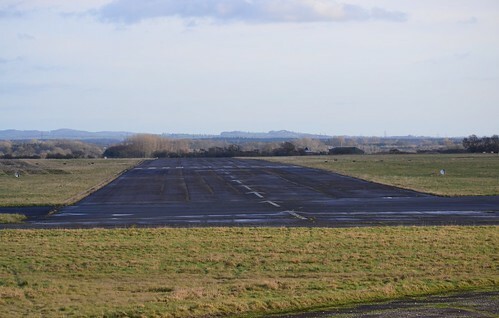 It is this runway that is used today, very much a smaller part of the original. 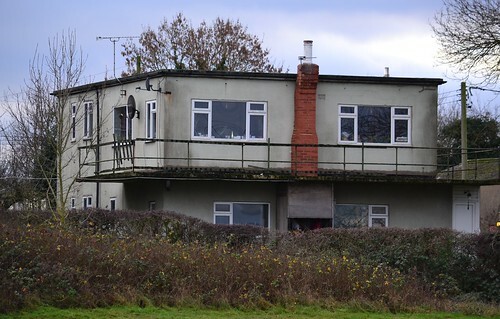 The former watch office is also here, tucked away behind hedges it is now a private residence. Various huts and small buildings can be found here, the whole area in a rapid state of decline and disrepair. Taking a left turn back onto the main road takes you toward the airfield with its modern buildings, hangar space and offices. A small but excellent cafe ‘The Apron’ provides refreshments and the chance to sit and watch the activities of this small but thriving airport. There is also further evidence of the airfields history here, one of the hardstands now forms a parking area, discernible only where a careful eye will distinguish its outline amongst the more modern structures around it. The general state pf the site suggests a bleak future for these historic buildings. Compared to front line operational airfields Gamston’s history is perhaps ‘less intense’. 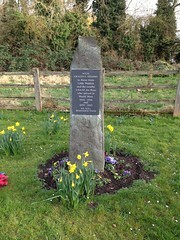 But, in the bigger picture of Bomber Command, it is a major cog that helped turn the wheels of this massive wartime organisation, providing trained crews for operations over a country, whose determination to destroy all in its path, was finally brought to its knees by those who passed though Gamston’s very doors. As we leave Gamston behind, we return to the A1 and head north and yet more trails around Britain’s forgotten airfields. AIR 27/127/24 – 9 Squadron ORB National Archives. Chorley, W.R., “Royal Air Force Bomber Command Losses Vol 7“, Midland Publishing, 2002. The website for Retford (Gamston) Airport has details of its operations and facilities. My thanks to the anonymous reader for the update of the 1970s/80s.